This article is reprinted from Nzymes, a supplement that we sell in our retail store. Welcome to the club. According to many recent polls, “dog allergies” is the number one ailment diagnosis heard from veterinarians these days. Yet, if you look deep into the research, true "dog allergies" situations are actually not very common. 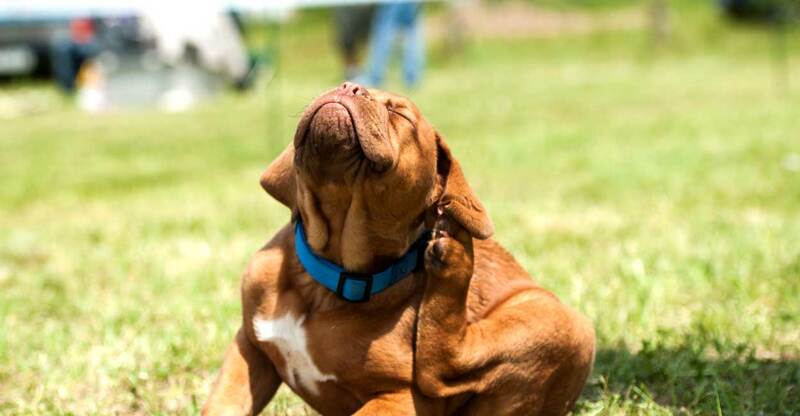 So why is your dog itching and scratching all over? For these next few moments, just consider this: Maybe the real problem isn’t actually allergies at all, but actually another issue – which is actually ‘resolvable’ AND is so very easily caused in dogs that are usually over-vaccinated these days. This may seem like a big leap to you, but please read to the end. Let’s discuss 5 major myths I think every dog owner should know about dog allergies. This just happened to a friend of mine: a quick trip to the vet because of a few itchy hot spots turns very serious. The vet has the doggy dermatologist run a few tests and says, "He's allergic to just about everything. That explains it." Think about it. How likely is it that a dog would be allergic to grass, trees, meat, fish AND you? Aren’t dogs made to live in the grass, hunt their own prey and handle any number of weird things in the puddles they drink from? Doesn’t it seem that human dander (another alleged offender in the 'allergy' battle) would be the least of concerns given the far more offensive things that they roll in at the dog park, or around your home? The truth is, if your dog’s immune system is at all compromised he may "appear" to be allergic to any number of things. It’s called a heightened state of response and will actually cause false positives in allergy tests. It is far more likely that your dog is dealing with an issue within the immune system itself. A weakened immune system is often a result of a GI tract that is out of balance. Improper nutrients in the diet can accelerate the diminishing of friendly, intestinal bacteria and allow an overgrowth of yeast fungus (candida) in his gut. Yeast by-products will always find a way out – mainly through the easiest and most abundantly available route: hair follicles, followed by SKIN. The skin, being the largest organ of the body, will always be involved when the body is cleansing toxins, poisons, and other elements – like yeast by-products or dying cells. Other popular exit routes are ears and paws. In fact, the earliest signs of problems with yeast overtaking the gut will show up at ears, paws, or both. Negative. All grains are not created equal. Grains are seeds of grasses cultured for food. They are all sources of carbohydrates, which provide energy to the body. Grains are very rarely the problematic source of dog food allergies – the rare occasion of these allergies are actually more commonly caused by meat or dairy, not grains. When the meat sources of your dog’s food are not changed regularly, it is possible for a dog to develop a food allergy to it. If you think your dog has an allergy to his food, change the meat protein source (i.e. substitute chicken for lamb) and add an immunity booster to the diet. You should see a complete recovery of the allergy symptoms within two weeks, max. If you don’t see the recovery, it’s time to try the same thing with dairy. This is the good way to decipher if a dog food allergy is actually causing the problem. While it is possible for a dog to have an intolerance to a specific grain or other protein, dog food allergies are not very common. There is a big difference between food allergies and food intolerance. Food allergies surface as itching, scratching, hot spots and secondary skin infections while a food intolerance will generally show up as diarrhea and vomiting. Very different symptoms. It’s an endless effort rewarded by good days...but you still have those bad days all too often. So. Maybe your dog actually has allergies. If you’ve considered all the possibilities, done all your research and are confident of the diagnoses, I’m sorry to have wasted your time.